We are firm believers that salads never have to be boring. If you think they are, then you aren’t making them right. 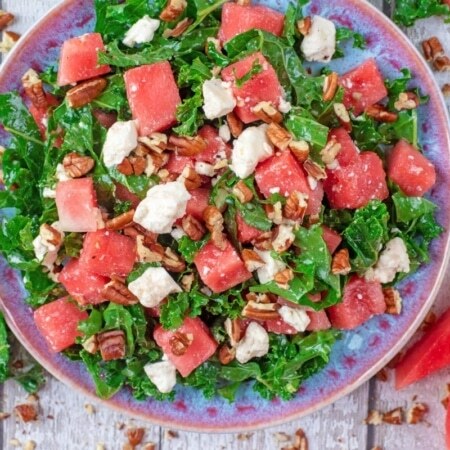 This Kale, Watermelon and Feta Salad is refreshing, super simple and packed full of all the good stuff. With its sweet and salty combination, it’s the perfect side dish for your next BBQ. This might seem like a strange combination, but trust us on this one – it really works. 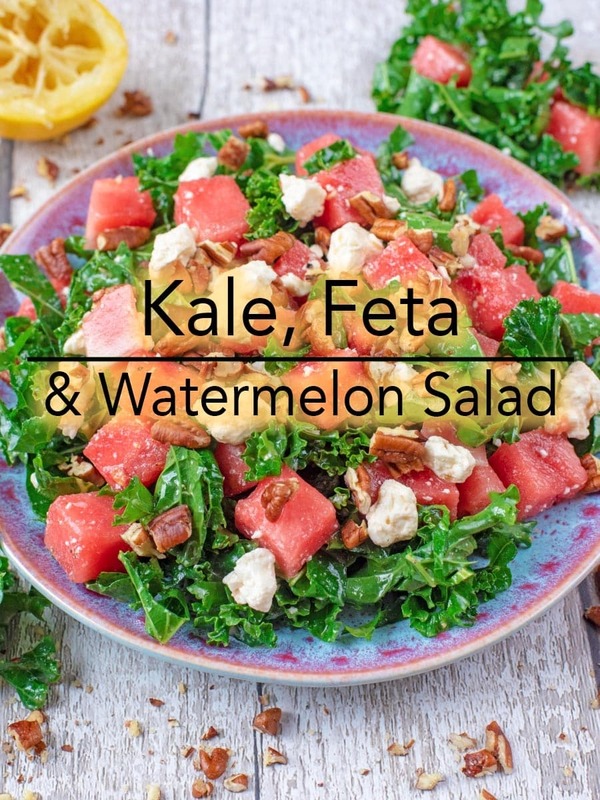 The saltiness of the feta and the dressing pairs beautifully with the sweetness of the watermelon. The kale makes the perfect super green base and finishing off with a sprinkle of pecans adds plenty of crunch. Watermelons are pretty huge! Although we can get through a fair amount in one sitting when it’s hot, we often have some leftover that we can’t get through before it starts to go off. This watermelon feta salad is the best way to make sure you aren’t wasting any watermelon. You just cut it in to chunks and throw it in. 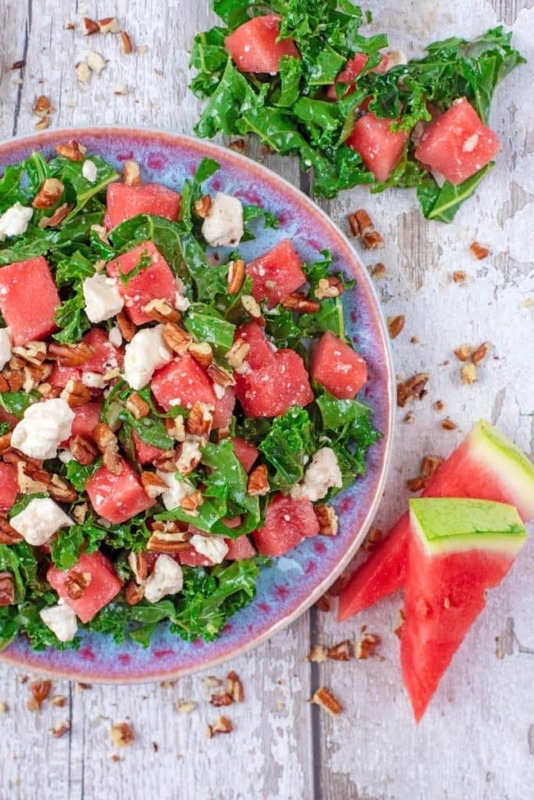 Kale, Watermelon and Feta Salad is a simple summer salad to feed a crowd. This recipe is inspired by our island hopping trip round Greece a couple of years ago. 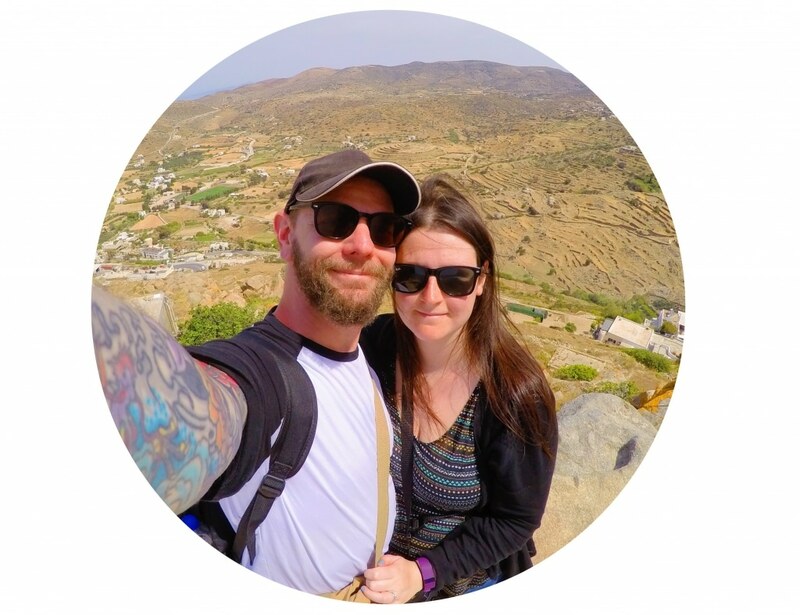 Being in Greece was like a feta pilgrimage for me and you can bet that I made the most of it whilst there. Feta was part of pretty much every meal, but one of the best ways I ate it on the trip was with watermelon in a salad. We have been creating it at home ever since. You don’t want anything too overpowering because the watermelon and feta are pretty strong flavours. We just used a drizzle of olive oil, some cider vinegar and lemon juice. You can add some extra sweetness with a drizzle of balsamic glaze when serving. What Other Cheese Can You Use in This Salad? I think it’s clear how much we love feta by now, but you know what we also love? Halloumi! It’s a cheese that squeaks when you eat it and what’s not to love about that? Halloumi is best when grilled as it holds its flavour and has a real meaty texture to it. Add a few slices to this salad instead of feta for a filling meal. You might not have had kale in a salad before, but it’s one of my favourite greens in a salad. It has so much more texture and bite to it than lettuce, not to mention more nutritional benefits. Plus, look at that vibrant green colour. If you usually find raw kale chewy, then you might prefer this salad because the dressing really softens it up, especially if you leave it for 30 minutes before adding the rest of the ingredients. 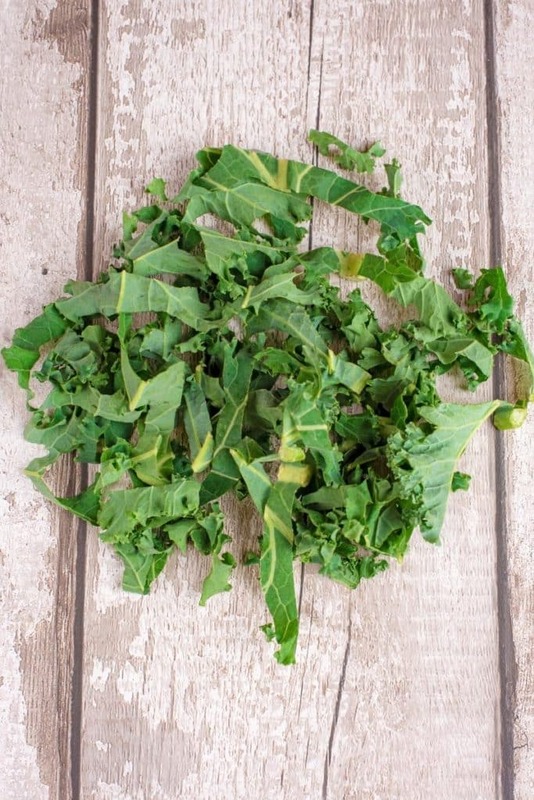 If you really aren’t a fan of kale, then you could use rocket (arugula) or spinach instead. I think one of the reasons so many people think salads are boring is because they lack texture. We combat that by always adding something crunchy on top like the pecans in this recipe. Whilst croutons are a classic crunchy salad topping, why not change things up and go with nuts like pecans, almond flakes or cashews? You could even use seeds like sunflower, pumpkin or linseed. One: Roughly chop the kale, wash well and put in a large bowl. Two: Add the olive oil, cider vinegar, lemon juice, garlic and salt and pepper to the kale and mix well. Three: Add the watermelon and feta and gently mix. Four: Serve in to a bowl and top with the crumbled pecans. If you aren’t a feta fan , then grilled halloumi makes a great substitution. It gives the dish much more of a meaty texture and feels more like a whole meal rather than a side dish. Speaking of grilling, grilled watermelon is amazing. It really brings out the flavour, changes the texture and makes a great addition to this salad. Just cut the watermelon in to bigger chunks/slices to that it doesn’t fall through the grill. We haven’t added any herbs to this recipe, but in the past we have used fresh mint in it and it pairs beautifully with the watermelon and feta. Another delicious addition to this salad is some olives. It gives a little bit of extra saltiness, along with the feta, that contrasts the sweetness of the watermelon. Not got enough greens in this? Add some chunks of cucumber or celery for some added texture and to make it even more refreshing. If you are all about the sweetness in a salad, then swap the apple cider vinegar for balsamic vinegar. Or, add a drizzle of pomegranate molasses at the end. 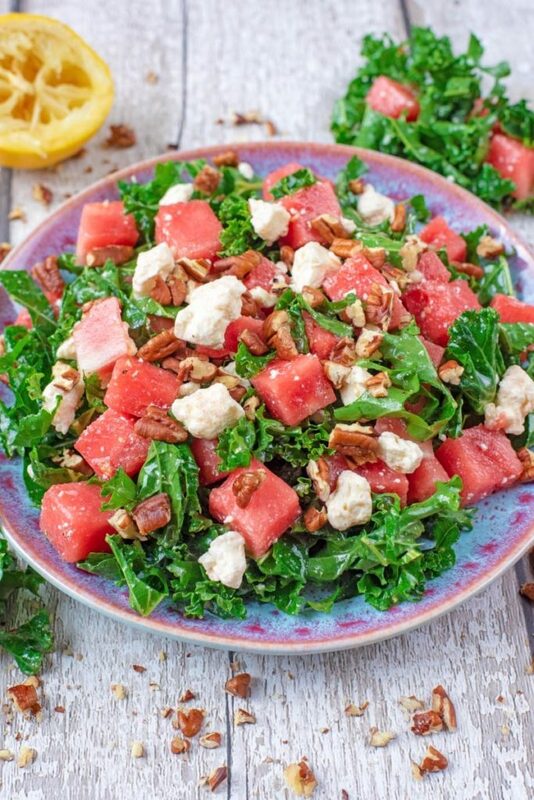 Do you want to be kept up to date on more delicious posts like this Kale, Feta and Watermelon Salad? Please subscribe to the blog mailing list (it takes 30 seconds). 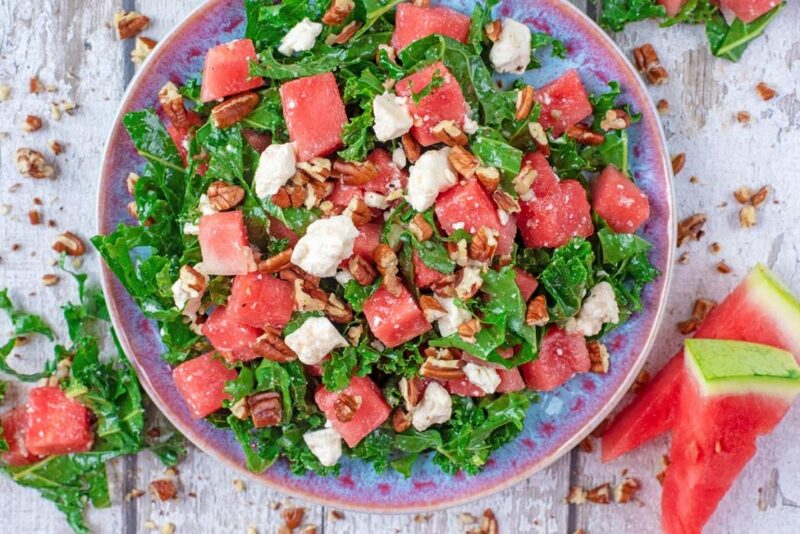 If you’ve tried this Kale, Feta and Watermelon Salad or any other recipe on the blog then let us know how you got on in the comments below, we love hearing from you! You can also FOLLOW US on FACEBOOK, TWITTER, INSTAGRAM and PINTEREST to see more delicious recipe ideas, behind the scenes shots and also what we are getting up to. 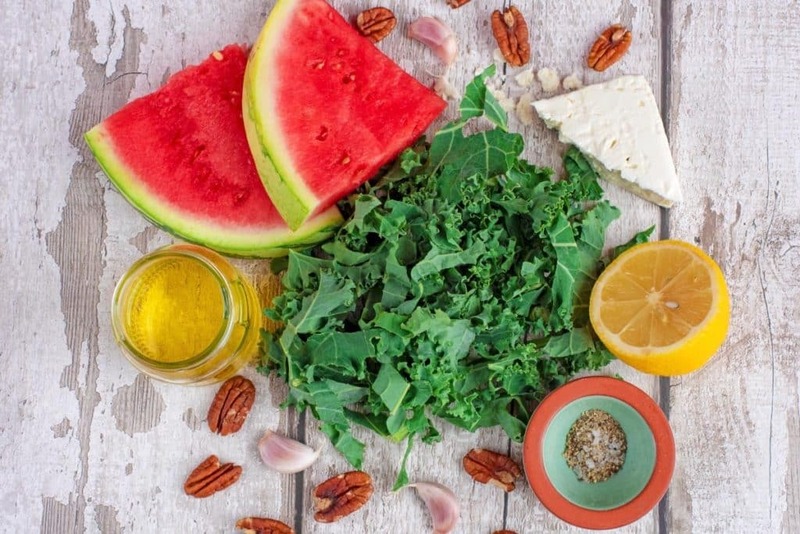 This Kale, Feta and Watermelon Salad is refreshing, super simple and packed full of all the good stuff. With its sweet and salty combination, it's the perfect side dish for your next BBQ. Roughly chop the kale, wash well and put in a large bowl. Add the olive oil, cider vinegar, lemon juice, garlic and salt and pepper to the kale and mix well. Add the watermelon and feta and gently mix. Serve in to a bowl and top with the crumbled pecans. If you aren't a feta fan , then grilled halloumi makes a great substitution. It gives the dish much more of a meaty texture and feels more like a whole meal rather than a side dish. Speaking of grilling, grilled watermelon is amazing. It really brings out the flavour, changes the texture and makes a great addition to this salad. Just cut the watermelon in to bigger chunks/slices to that it doesn't fall through the grill. We haven't added any herbs to this recipe, but in the past we have used fresh mint in it and it pairs beautifully with the watermelon and feta. This is my kind of salad! Perfect for summertime, pinning this one to make! Watermelon and feta goes hand in hand. I love this combo. I never added kale to mine and I think it’s a great idea. This salad looks so delicious! The watermelon and feta must be glorious together! Salty and Sweet! I’m definitely giving this one a try! Thanks! This is such a lovely flavor combination for a salad! I looooove putting feta on salads. This is such a great idea! 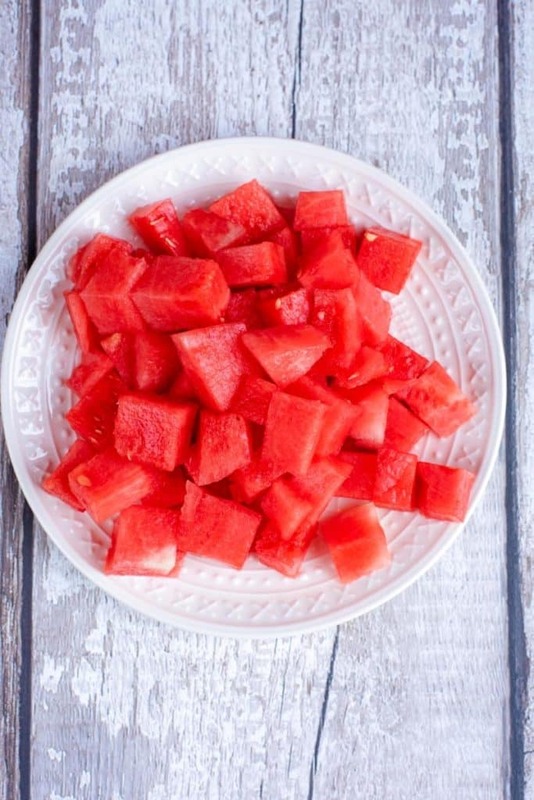 Love watermelon and this looks so good!! Will be making these for sure! 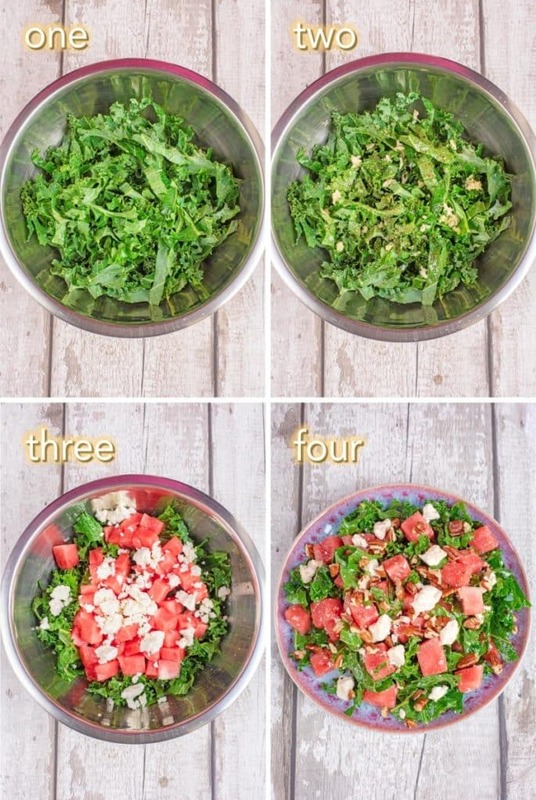 I love the idea of adding in some watermelon to a salad. This is such a great dish for summer. Watermelon and feta…such a yummy summer staple. And kale too? You’re a girl after my own heart! I’ll have to try that…just pinned for later. Thanks! Watermelon and feta is always a huge hit at our house! I need to try the halloumi variation you suggested. I’ve never had watermelon saald, but this looks delicious! I love the feta and pecans! This is my kind of salad! 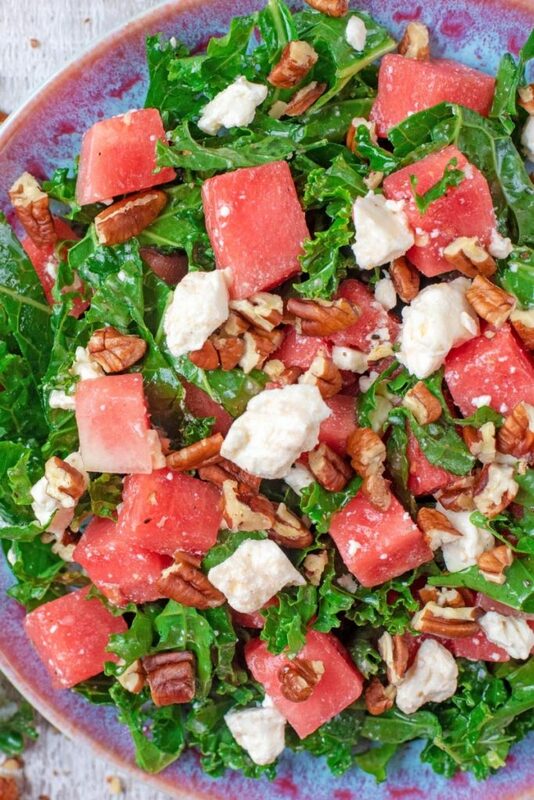 Love the idea of adding watermelon to a salad in the summer!